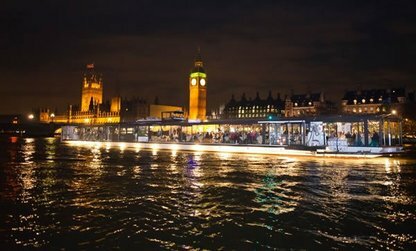 The most sophisticated London Dinner Venue offering breath-taking views of Central London, join us on board for the Thames Bateaux Dinner Cruise. The Thames Bateaux Dinner Cruise compliments a modern British Cuisine freshy cooked on board – offering a mouth watering choice of food from an A’la Carte menu. Enjoy the stunning sights of London whilst relaxing to a resident live band performing on the night. There is no other way to celebrate a special event with fine food and an extensive wine list. Our popular Thames Bateaux Dinner Cruise offers the best in spectacular views, taking you past the Houses of Parliament, under the major iconic bridges such as London Bridge & Tower Bridge heading towards the Docklands and Millennium Dome. It’s the perfect way to see London with the comfort and panoramic views from the classic M.V Symphony and M.V Harmony cruise boats, whilst enjoying a freshly prepared A’la Carte Silver Service Dinner. pickled baby vegetables, wholegrain mustard dressing, focaccia. 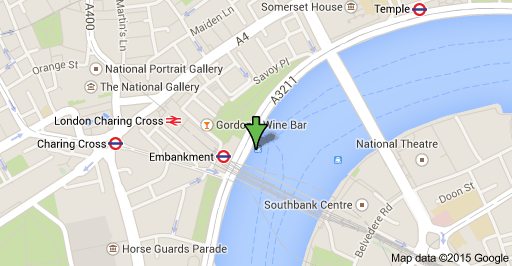 Boarding takes place from the Embankment pier located opposite the Embankment Underground Station. Dress Code - Please be aware that we have a smart formal dress code on board. Trainers, flip-flops, shorts and leisurewear are not permitted and you will be refused entry on to the boat. For men, a jacket and a pair of trousers, or smart dark denim jeans are allowed, and a tie is preferred, but not essential. We suggest that ladies can wear smart cocktail dresses, or trousers….just get dressed up and enjoy the occasion!